Thanks to a helpful reminder from #foodallergy friend Jenny Sprague aka @xFoodAllrgyhelp, we now have the details on this year's Portland Sea Dogs peanut free game. Please take a few minutes to check out her blog: Multiple Food Allergy Help. 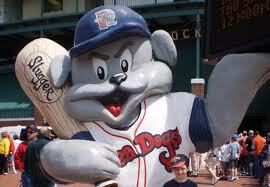 According to the Sea Dogs' Sales Director of Ticketing, "The peanut free game is Sunday, May 20th at 1:00PM. The peanut free section is located in our US Cellular Pavilion (right field seating modeled after the monster seats at Fenway). The pavilion will be cleaned out thoroughly the night prior by our cleaning crew, including power washing the entire section the appropriate amount of times. There is also a separate entrance for customers who purchase the peanut free section tickets. We put signage when entering the section that states “entering a peanut free section” and when leaving the section that states “leaving a peanut free section”. Tickets may be purchased at the box office or online.